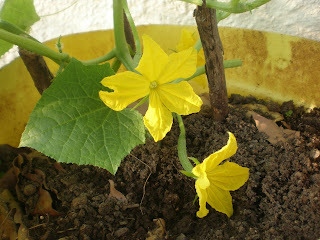 Today I wanted to share the star of my garden at the moment- European Cucumber from geekgardener. I sowed the seed on 27th December and it germinated in just four days. After that, I have been watching the growth of this plant keenly. I have never been successful growing cucumbers- the plant gets infested with aphids, leaf miners and poor growth frustrates all my attempts to get decent fruits. 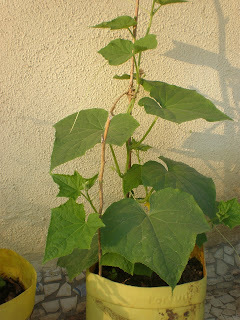 I have grown it in a 15L container and it has grown to over 3 ft. There are female flowers on each node with two side branches. Geekgardener's blog describes European cucumber as a parthenocarpic type ie formed without fertilization and each flower will grow into a fruit. No messing about with paintbrushes for pollination, which I do for brinjals and even capsicum. So, if you have a flower, you will get a fruit. I have been keeping my fingers crossed for so many days now, spraying with neem oil and vermiwash. There is some infestation with leaf miners, but no aphids yet. Finally the first flowers bloomed, four at a time! And now the agonized wait for the fruits to develop well. According to geekgardener, it will take approx 14 days for the fruits to mature. So a fortnight of waiting and waiting! I am looking forward to seeing your cucumbers. Pls do post pictures of the fruit. BTW, are European Cucumbers different from the regular cucumbers we get in the marker? Cucumbers are taking their time :(. I had some issues with the fruits not developing, hence had to remove some of the baby cucumbers. I really don't know how they taste, looking forward to it!